Pilkington pyrostop made with multiple laminate of float glass and special transparent intumescent interlayers, which are totally compatible and optically homogenous with the glass layers. When exposed to fire, the pane facing the flames fractures but remains in place and the interlayers, one after the other, foam up to form an opaque insulating shield that blocks the heat of the blaze. 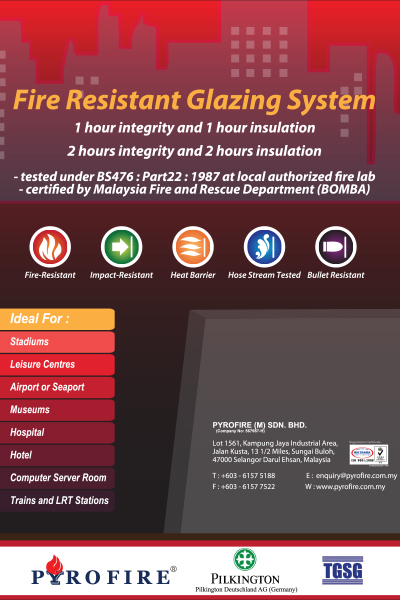 When selecting or specifying fire rated glass complete system, ensure that the Malaysian Fire and Rescue Department (BOMBA) certify it. Upon completion of the installation, it is a mandatory requirement for the Building Architect or the Main Contractor to submit Form C1/C2/C3 issued by the supplier of the fire rated glass system to the Malaysian Fire and Rescue Department for endorsement to facilitate issuance of the Certificate of Fitness for the building by the relevant Local Councils.